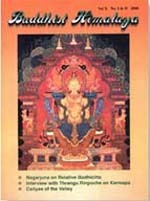 The Buddhist Himalaya is one of the several projects of Nagarjuna Institute and is intended to promote Buddhist Studies in the Himalayan countries namely Nepal, Northern India, Tibet, and Bhutan. It aims at presenting the articles in the area of Philosophy, Art, Iconography, History, biography, Monuments and Manuscripts. We'd like to hear reader's comments and suggestions for the further development of journal. It welcomes the submission of the articles and research papers in English adequately documented. All right reserved @ Nagarjuna Inc 2001.Chakupat, Lalitpur.